Collecting Asylum: Update, part 2! Here is part two of my photo update :) I know I said check back in a few hours, and it's been a bit more than a few hours, but hey - at least it's getting done! 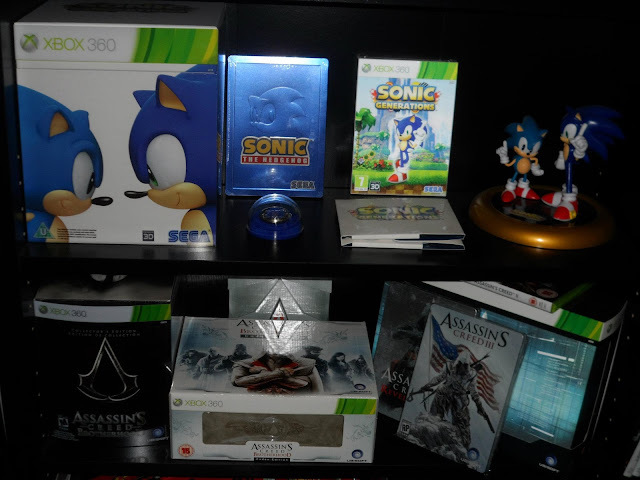 Top shelf: the Sonic shelf, contains my Sonic Generations Collector's Edition, of which the contents are on display, and a sealed copy of the Australian exclusive Sonic Generations steelbook (which was a preorder bonus over there I believe). Underneath we have the Assassin's Creed shelf, which is fit to burst! 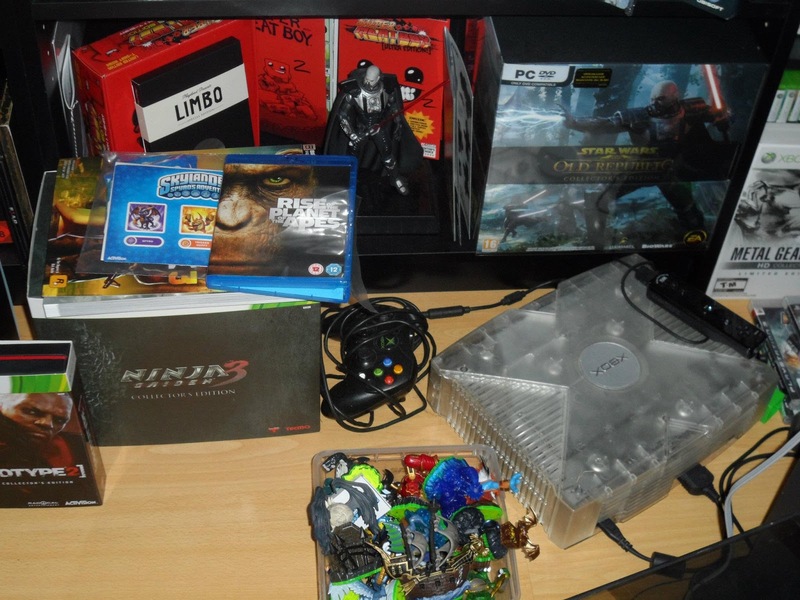 It has the Assassin's Creed Brotherhood Collector's Edition on the left hand side (the one with the Harlequin jack-in-the-box), the Codex Edition of AC:B in the front centre, behind that is the Assassin's Creed Revelations Collector's Edition (albeit barely noticeable) and on the left hand side is the Animus Edition of AC:R with two steelbooks in front of it - one for Revelations, and the other is the preorder bonus steel for ACIII. This is my sort of "neglected" shelves, which are unfortunately located behind my television due to lack of space. So things tend to be a little messier on these shelves as it's pretty difficult to get into! 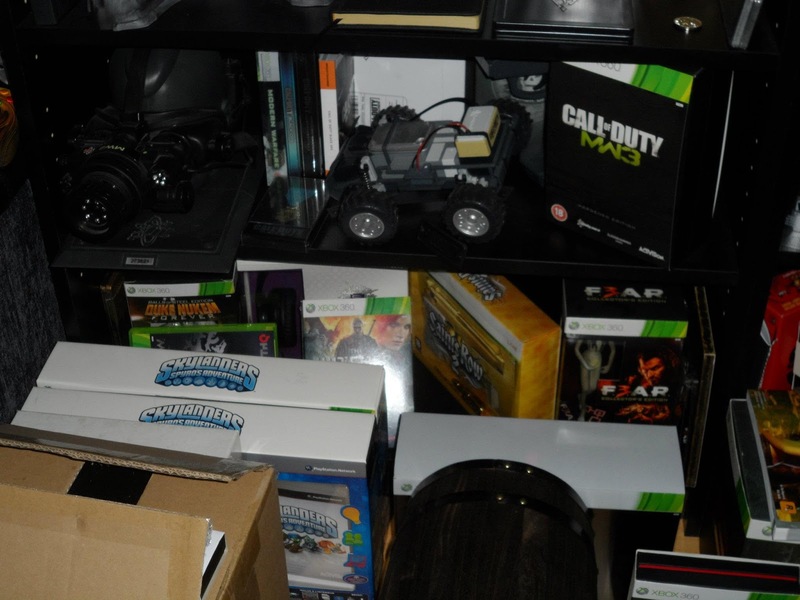 Top shelf, we have three PC editions, and one Xbox 360 edition. 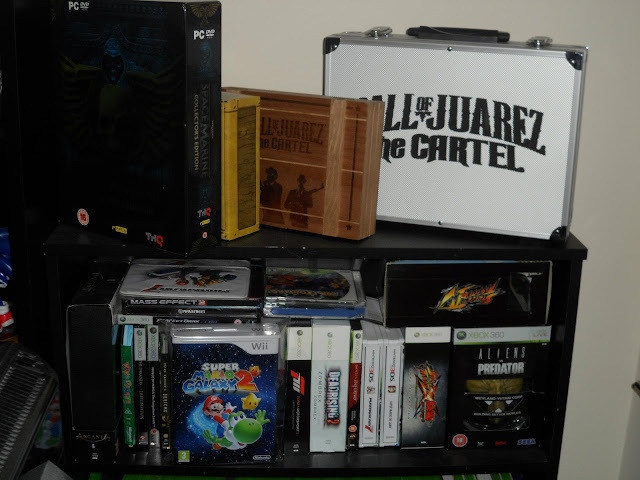 Originally had planned the top shelf to just be for PC editions, but couldn't really have one Call of Juarez The Cartel CE there without the other! So as you can see, there is the Warhammer 40,000 Space Marines Collector's Edition, behind it (barely noticeable) is my Tales of Monkey Island CE, and behind that my Call of Juarez The Cartel Outlaw Edition and Polish Collector's Edition, respectively. 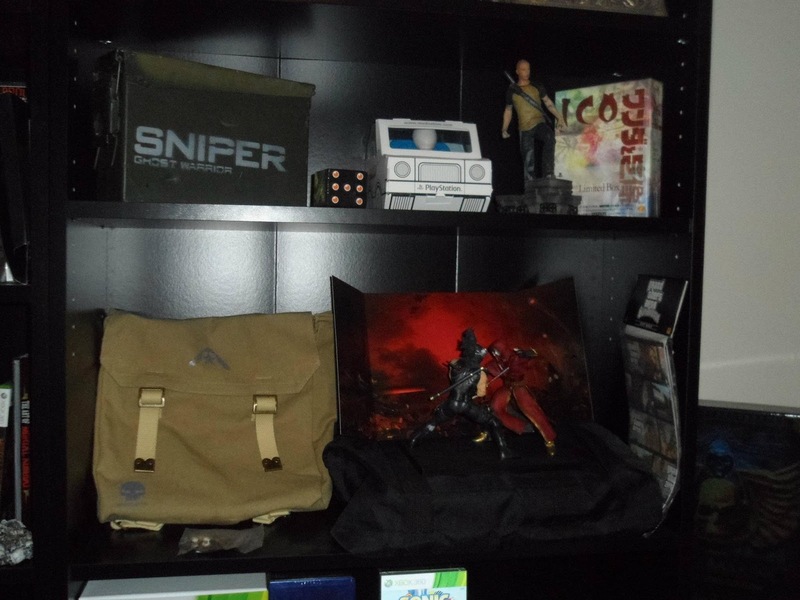 Underneath, there are a variety of steelbooks, tins, smaller CEs, and a couple of 3DS slipcovers. I'll do a proper show of that shelf at some other point, probably whenever I move the TV to actually get access to it! Lower down on these shelves are just all standard copy Xbox 360 games, and a few with slipcovers. 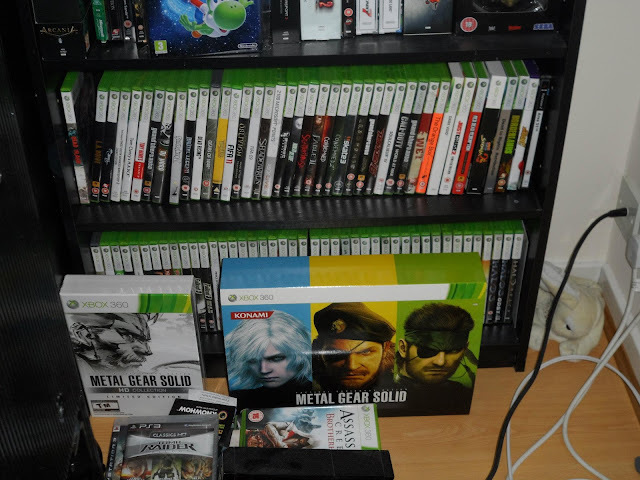 And on the floor in front of it is my copy of Metal Gear Solid HD Collection NTSC CE, and MGS HD Limited Edition (Zavvi Exclusive). In front of those are some stadard copy games that have recently been played/purchased, and yet to be put away (I know, messy messy!). And in the far right of the image, some of you may notice a creepy little squashed up bunny. That is, in fact, a hand puppet, that AJ decided to launch behind the TV, and I can't reach to rescue it haha! Back to the main set of shelves now, and this is the lower sections, and as you can see - there is quite a lot on the floor in front of the shelves (that's how much I'm struggling for space!). Underneath, there is my Duke Nukem Forever Balls of Steel Edition, Saints Row The Third Platinum Pack, Saints Row 2 Collector's Edition (in gun packaging), in front there is my Witcher 2 Enhanced Edition (signed by a member of the CD Projekt dev team) and on the right hand side, you'll see my F.3.A.R CE and (probably invisible due to shoddy lighting) F.3.A.R steelbook and Press Kit. On the floor in front of the shelves, I have two Skylanders Starter Packs (one for Xbox 360 and one for PS3), my Diablo III CE (right in front of Skylanders, behind the brown box) and Witcher 2 Dark Edition to the right of the Skylanders packs. Floor picture, from a slightly different angle, shows that the brown box to the left is my Max Payne 3 Special Edition (have left it in it's outer box to protect it for now) and it has the preorder bonus pen tucked in the top of the box too. 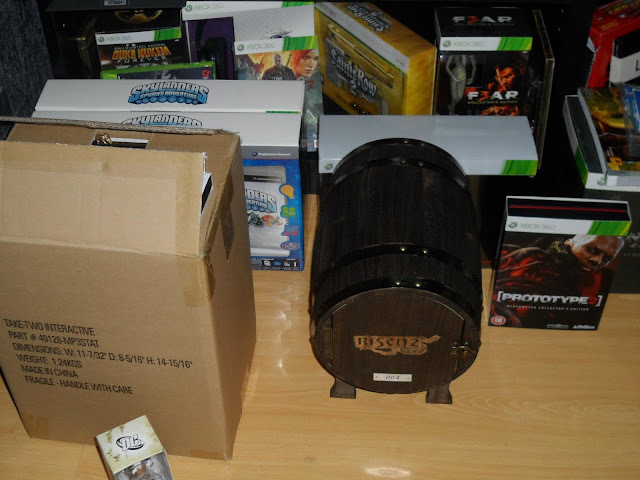 My Risen 2 Keg Edition (which is GORGEOUS by the way) and then to the right, my Prototype 2 Blackwatch Collector's Edition. Bottom of the other side of shelves, I have a PC shelf, which contains a variety of items related to Super Meat Boy, all signed by Team Meat, my Super Meat Boy Rare Edition (not signed), my Limbo Collector's Edition (which was exclusive to Germany I believe) and my Star Wars The Old Republic CE, in which my poor little Darth Malgus statue was maimed a while ago (AJ decided to throw a disc at it and chopped his arm off!) but has since been repaired with some glue whilst I wait on a replacement!